Have you ever stood at a tile shop facing a wood look-a-like tile and wondered: Why not just use wood flooring? There are reasons that people go with tiles vs wood flooring, even when they want the same look. It's important to consider usage as well as aesthetics, but ultimately, it's up to you to decide what is most important for your design. To help guide you in the choice of materials on your next remodeling project, Here are some of the reasons why some people choose one over the other. One of the biggest reasons people choose tile, even wood look-a-like tiles in the kitchen and bath is simply because they anticipate a lot of spills, whether water or otherwise. Wood is far less forgiving with a wet environment than tile. It can get stained or discolored if a wet spot is left too long without wiping it up. You might think this is odd, considering that you damp mop a wood floor to keep it clean. However, the difference is in the amount of water and how long it stays on the surface that can cause the damage. Tile floors are waterproof and can be sealed, making them a better choice for wet environments. For those people that enjoy the look of wood in a kitchen, the comfortable compromise is to go with faux plank flooring using tile wood look-a-likes, like this one. People may be frightened of maintaining stone tile flooring, like marble, because they've heard it too can get stained with wine or bathroom liquid and needs to have regular maintenance. However, it's not a difficult task. 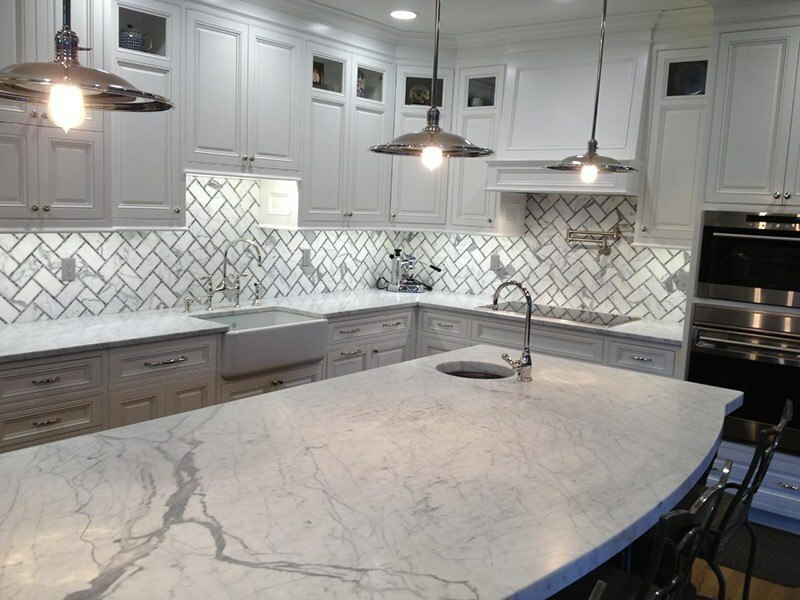 When properly sealed, you can still use a light-colored marble as a backsplash in the kitchen or as a countertop, as well as floors, as in this example. 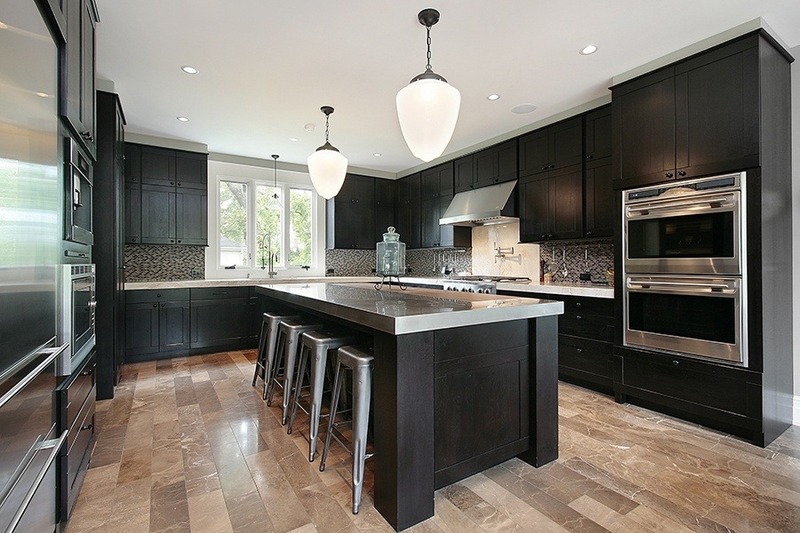 Wood floors can be dry or wet mopped, but that doesn't make them light maintenance. Sunlight coming through the windows can also discolor sections of the floor. They tend to scratch easily because the wood is soft. 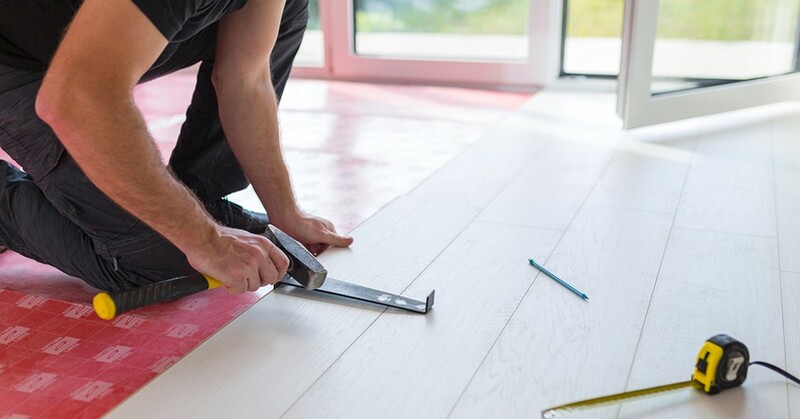 Thus, to bring them back to their original luster and even-toned scratch-free appearance, wood floors have to be sanded down (usually by a professional), refinished, and polished - the entire floor! You might only have to do this every 10 years, depending on the condition of the wood floors, or sooner if you see a lot of damage earlier. On the other hand, marble needs to be resealed every 3 to 6 months, but it doesn't require an expert to do. You just follow the product instructions and spray or wipe it on and then wipe it off. This makes it easy to maintain a large tile floor in top condition with minimal maintenance, even when it is a light color, like this one. People often choose tile simply because the designs are endless. Wood flooring has a uniform look with some woods being a lighter version than others. Tiles, on the other hand, can be used in ways that wood is typically not used. You can get some tile-like designs with wood parquet floors, but these tend to go in and out of fashion and can also date a home. Thus, people who choose wood floors tend to like the classic, uniform, look of wood in all rooms, besides, the bathrooms, because it gives the house a bigger feel and can be less expensive than tiling. However, those that want a more custom look tend to favor different flooring in different rooms, sometimes opting for tiles and other times for wood. They also tend to use more than one type of tile in a room design to heighten the aesthetics of a room. 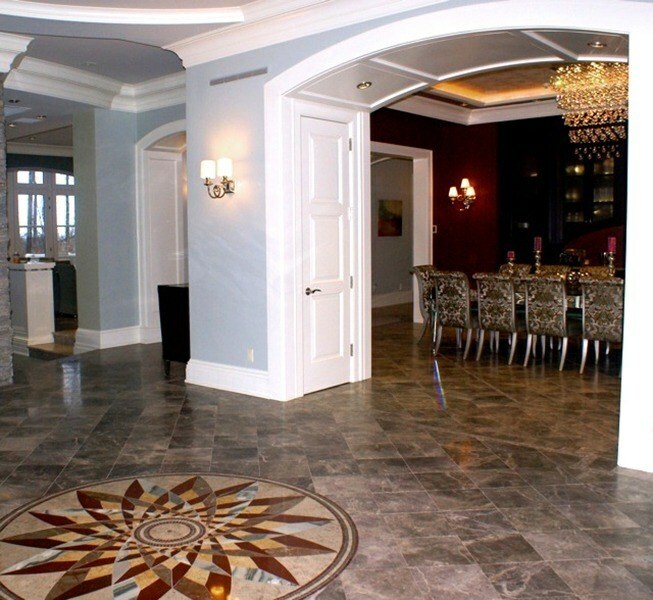 Take a look at this floor design using waterjet cut stone tiles to create a round medallion set in a classic floor of square tiles made from a different stone material. 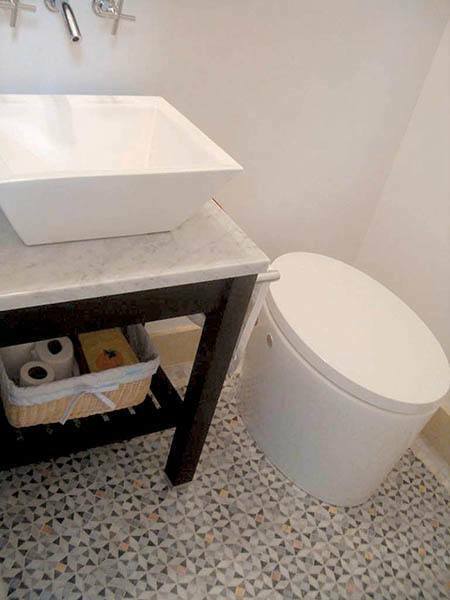 Tile designs are notoriously long-lasting. We have some beautiful examples of that from ancient Roman ruins where mosaics, once restored, shine forth beautifully after centuries of being forgotten. Ceramic and stone tile are very hard and long-lasting, but the grout is not and may need to be redone. Tiles can chip, thus needing to be replaced, but if you have a spare tile, it can be done one at a time. However, wood floors can't possibly stand up to the type of aging that tile designs are capable of enduring. You can't just redo a small section and have the entire design look like new again. Thus, people who prefer a permanent design, that is easily fixed, and that is going to last as long as they're alive, they go with tiles, even when it's a complex mosaic for a bathroom floor. Tiles conduct heat much better than wood for radiant heating technology, so that they become the natural choice when this is a part of the design. 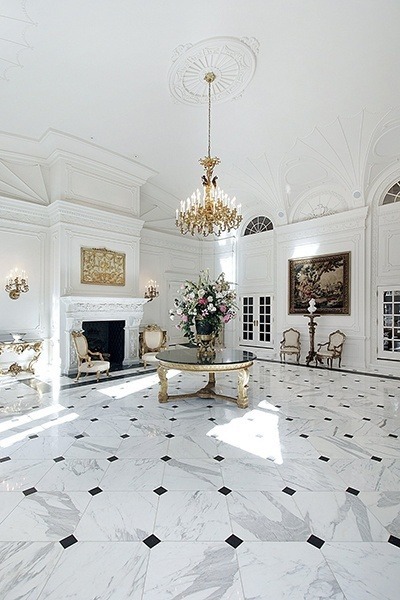 Imagine this cool, almost icy, design made surprisingly comfortable with radiant heating underneath the marble. It doesn't just look good, but it feels good when you place your feet on the floor. Tiles Vs Wood Flooring: Which is Right For You? Without aesthetic considerations, most designs would be bland. However, usage is an important consideration too. The aesthetics often come out ahead, although functionality, still might take center stage if the choice is to go with radiant floor heating or not. Luckily, there are wood and tile materials that can mimic each other, so that you can choose a wood look-a-like tile if you like the look of wood, but want something far more durable. When you are considering tiles vs wood flooring, think about the design, maintenance, durability, and environment before you make your final choice. Which would you choose? Nelson Londono founded Artsaics in 1998 after learning the ins and outs of designing custom artistic tiles and stone mosaics. 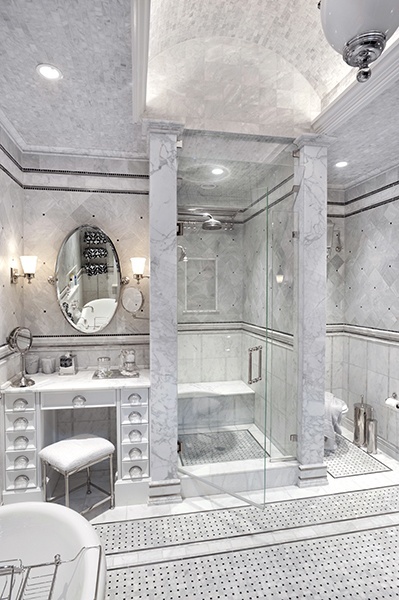 The New York-based surfacing company specializes in producing stunning artistic tiles & stone designs with fine natural stone from around the world. Nelson and his team's passion lies in working with their hands, heads and hearts to make each and every space a unique reflection of self expression. You can learn more about Artsaics here.